With a stay at this villa in Agnac, you'll be within the region of Zoo de Mescoules and Barthe Golf. 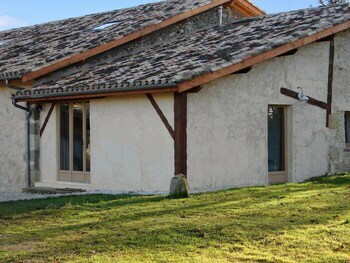 Located in Cleyzieu, this vacation home is within the vicinity of Espace Eau Vive and Church of Villebois. With a stay at Château de la Frogerie in Maulevrier, you'll be 6.8 mi (11 km) from GlisséO Complex and 7.7 mi (12.5 km) from Meilleraie Exhibition Park. Free self parking is available onsite. With a stay at Hotel le Terminus in Dagneux, you'll be within the vicinity of Lyon Golf Club and Waves Aquatic Centre. Free self parking is available onsite. Located in Le Pechereau, L'Escapade is within a 10-minute drive of Chemiserie Museum and Argentomagus Archaeological Museum. Free self parking is available onsite. With a stay at this apartment in Saint-Raphael, you'll be convenient to Vieux Port and Frejus Cathedral. With a stay at B&B Hôtel STRASBOURG Nord Artisans in Vendenheim, you'll be within a 15-minute drive of Tomi Ungerer Museum and Fort Rapp. Free self parking is available onsite.